Win this fabulous clutch courtesy of herCatwalk.com, a new fashion neighborhood launching this winter. To enter, join their community pre-launch on facebook and leave a comment on this post. Once you become a Catwalker, you will also be eligible for their daily giveaways! You can get up to three bonus entries by submitting outfit photos to submissions@hercatwalk.com. Include your full name with your submission and leave additional comments on this post for each photo you submit. Contest ends December 29th at 9:00 a.m. CST. Open to international readers. Winner will be chosen at random. Ooooh, pretty! 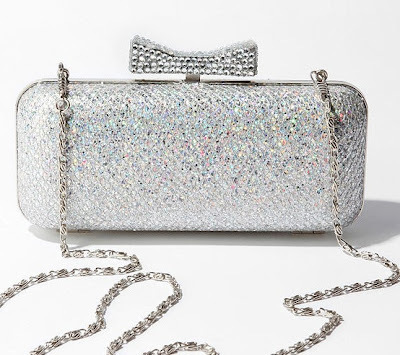 I've never owned anything so sparkly, so I hope I win! I "liked" them on Facebook! OMG ... that is adorable! I want it! I like them on Facebook, too! I joined herCatwalk a little while ago. :) Awesome giveaway! That would be soooo cute with a simple black dress. Hey guys! It's Michelle from HerCatwalk. Make sure you complete a profile on our facebook at http://www.facebook.com/hercatwalk?v=app_95936962634. @Five Foot Something- Patricia, you can email us outfit pictures at submissions@hercatwalk.com for up to three additional entries! That clutch has got to be the cutest one in existence! love!! i "liked" on facebook! Gorgeous! I liked on FB. wow that clutch is amazing!!! sounds fun, following on FB! Please enter me!! I'm following on facebook. I would LOVE to win this. Just joined! (I'm ktkatherine on facebook). This clutch is so beautiful, I love the bow detail on the lock. I can think of so many beautiful outfits that this clutch could be paired with. So awesome. I liked them on fb as Tee Jay. Just entered my first outfit submission. And my second entry is submitted! I am also following along on FB.